Small businesses are continuing their sharp focus on cost control and cash conservation. However, “cost” is sometimes a tricky item to nail down. Too often, small business owners focus on short term costs and while in most cases this approach is absolutely valid, at times it can lead to situations that cost them more. The choice between maintaining older PCs and replacing them with newer PCs is one such area. However, these small businesses should re-evaluate this decision given the higher cost of maintaining older PCs which has a larger cumulative effect on the budget than purchasing newer PCs with latest technology. Techaisle, conducted a global survey of 736 small businesses in six countries to understand the comparative differences in costs of maintaining older PCs and newer PCs, associated quantifiable productivity lost and the impact of newer PCs. In light of the issues faced by PCs 4 years or older, replacing, rather than repairing and upgrading is a much more prudent course of action. The key to this is to consider both direct and indirect costs resulting from PC downtime. Small businesses are a good indicator to measure the pulse of economy in any country as they constitute over 98 percent of businesses within that country. They are intricately linked to large businesses, government departments and educational institutions as both suppliers and customers. A large percentage of consumers also rely on small businesses for products and services that they consume within their households. Information Technology plays an important role in daily operations of small businesses across all departmental functions including sales, marketing, operations, finance and customer support. 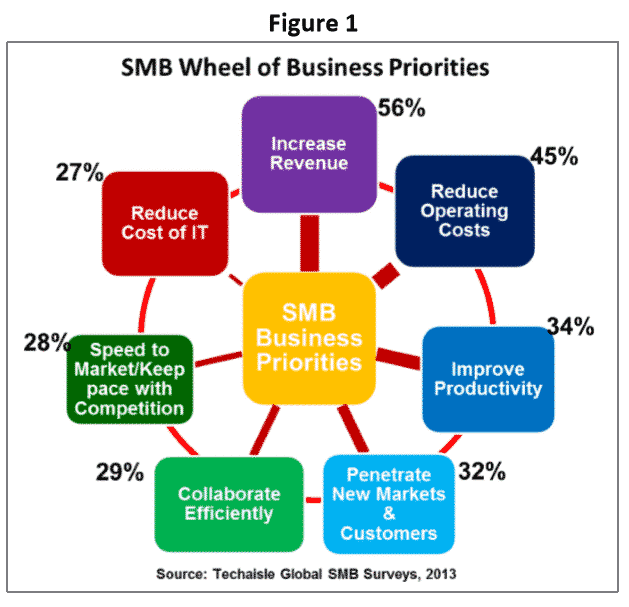 As seen in the chart below based on Techaisle’s Global SMB Surveys, 2013. Reducing operating costs and Improving employee productivity are among the top business priorities of small businesses and they are turning towards IT more than ever to achieve their priorities. Therefore small businesses become a natural target for IT companies to unload their marketing messages for products and services that help in reducing operating costs and improving productivity. However, sometimes it is as fundamental as staring at the device, namely PCs that run these applications to find hidden costs and identify productivity drainers. These devices are older PCs, usually 4 years or older. In fact, 36 percent of small businesses have PCs that are 4 years or older. This is as per a recent study conducted by Techaisle with 736 small businesses in six countries – US, Brazil, China, Germany, Russia and India. The study exposes the true costs of maintaining older PCs, frequency of repairs, hours lost along with an assessment of the most frequent types of application and systems performance issues encountered by PCs that unbeknownst to many small businesses are chipping away at their cash flows and productive work hours. 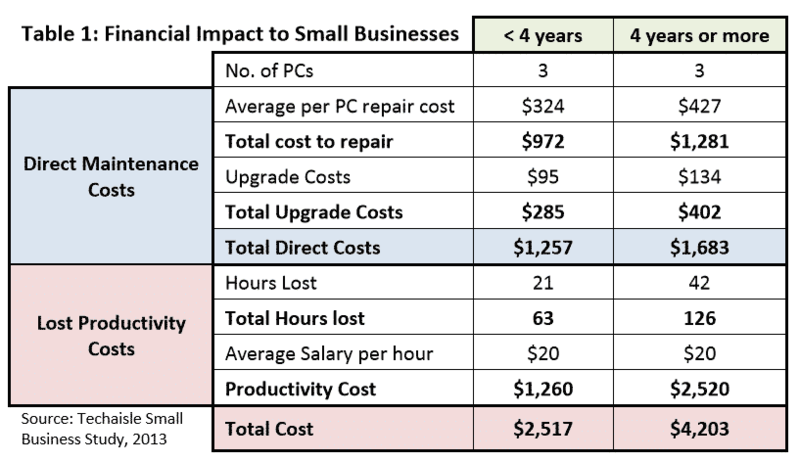 The study reveals that small businesses are spending an average of US$427 per PC that is 4 years or older on repair cost, which is 1.3 times the repair cost for a PC that is less than 4 years old. Cost implications vary widely for small businesses of different sizes. For example, among small businesses with 50-99 employees, the average cost of repairing PCs 4 years old or older is US$521 per year which is 1.4 times the repair cost for a PC less than 4 years old. The repair cost therefore either equals or even exceeds the purchase price of some new PCs. As the system performance of older PCs begin to degrade and the number of applications running simultaneously increase to an average of eight for small businesses, it is not surprising to see that 25 percent of older PCs are upgraded each year by small businesses which is 1.7 times as many PCs upgraded that are less than 4 years old. The upgrades add another US$134 per older PC. The above sentiment is echoed by small businesses across all countries surveyed. The study shows that 60 percent of small businesses will replace older PCs when the cost to repair is almost the same as the price to replace. When improving employee productivity is among the top business priorities of small business it is natural to assume that the businesses explore all options to achieve their priorities. However, in the daily grind of work sometimes cost reduction solutions staring in their face get overlooked unless someone demonstrates it to them. One such important opportunity is replacing older PCs with new PCs to avoid number of hours lost due to PC repairs. The study reveals that an average of 42 hours is lost due to an older being repaired by either internal IT staff or reseller or even friends & family. Slightly over 36 percent of small businesses have PCs 4+ years old and these PCs create many different types of problems for the both the owner and the employees. In addition, small businesses reported that they frequently experience Application and System Performance, Malware attacks and Connectivity related issues with PCs that are 4 years or older. Although it is difficult to quantify the impact of lost productivity due to these issues unlike measurable and quantifiable impact due to repairs, they also contribute to significant diminishing of productivity and employee satisfaction. Small businesses using newer PCs have felt several positive impacts; among the top are improved application performance, improved productivity, and reduced operating cost. Small business owners mentioned that newer PCs allowed them to run 60 percent more number of applications simultaneously without any degradation in system or application performance as compared to PCs that are 4 years or older. This is a significant improvement as small businesses are increasingly using several different types of applications simultaneously including business productivity applications, Email and web, online chat and video, line of business applications, social media interactions, finance and accounting as well as music and games. Let us say a small business has six PCs. Three PCs are more than four years old and three are less than 4 years old. Based on the data from the study we can calculate the direct costs and the cost of lost productivity for old and new PCs. Direct maintenance costs –In the above example, the direct cost associated with the older PCs including cost to repair and upgrades is likely to be $1,683 versus $1,257 for the newer PCs. (see Table 1). This is the cost that is “visible”. Productivity costs – In terms of lost productivity due to PC downtime, the three older PCs are likely to experience a total of 126 hours of downtime in a year, versus 63 hours of downtime for the three PCs that are less than 4 years old, that is loss of over three weeks’ worth of productivity in a year with older PCs. Assuming the average hourly salary of PC using worker is about $20/hour, the small business is losing $2,520 per year in productivity keeping the three older PCs in use. Lost productivity is the “invisible” cost. Adding these two costs together yields total cost of $4,203 per year incurred by a typical small business with three older PCs. To put it in perspective – that is equivalent to buying two to four new notebooks (depending upon specific purchase price). This article has been provided by Intel. All rights belong to Techaisle.